From the makers of the very cool solar-powered and anti-theft backpack, now the environmentally conscious folks at Solgaard in NYC bring you the Hex watch. Put one of these on your Valentine's wrist and you'll hex them to the extent that they're going to love you for it, but the Hex watch takes its name from the fact that it has a hexagonal face. The timepiece is housed in highest-grade stainless steel and the hex shape harnesses "gravitational logic" that allows your brain to tell time faster than with a conventionally-shaped watch. Women's styles are "The Mesh" with a stainless steel mesh strap in rose gold and "The Stone" which has a premium suede gray leather strap. Men's styles are "The Minimalist" for those who love black on black on black, and "The Conductor," for those who "make every second count." For every item Solgaard sells they commit to removing five pounds of plastic from the world's oceans. 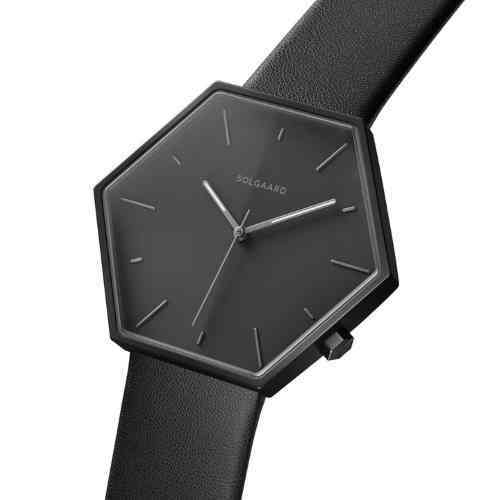 Purchase Solgaard Hex Watches on Amazon or here. "The History of the World According to Facebook"